* This target identification only functions with the induction balanced/ DD coils. ** These functions are only possible with additional detectors, coils, software, GPS navigation, cables, some of which are already available and others are in preparation. Details on request. 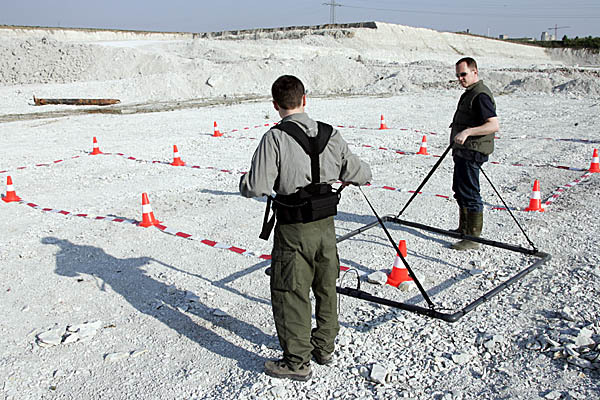 Lorenz metal detecting systems are some of the most sensitive and stable metal detecting devices of their kind currently available and they are designed primarily for professional search and location purposes. The LORENZ DEEPMAX X3 is the result of many years of research and development and is one of the newest developments in the field of Pulse GBS metal detectors. The LORENZ DEEPMAX X3 is designed to be used with either small or large coils. With frame coils it is possible to detect very effectively over large areas to considerable depth. In addition small coils can be used when searching for small metal objects. By enlarging the search coil very high detection ranges can be achieved. Therefore search frames with up to 3m square are available. The Pulse GBS (Pulse Ground Balancing System) is suitable for searching at depth and specially designed electronics cancel out signals from the ground. The LORENZ DEEPMAX X3 is therefore a reliable tool to locate metal objects even with extreme soil and environmental conditions. A new improved circuit design suppresses a range of interference from power lines or radio transmitters and a power pulse technique produces very accurate signals to obtain considerable detection depths. The LORENZ DEEPMAX X3 works with two different ground cancel filters. It has an extended depth capability for non ferrous metal objects and it is capable of identifying metal objects employing the two different target identifications. The Pulse Ground Balancing System GBS performs well because of the time delay between the transmitting and receiving phase. The high transmitting power is a fundamental advantage and makes operation with very large search coils possible. Because of its active working principle a high sensitivity range for both ferrous- and non- ferrous metal objects is achieved. The LORENZ DEEPMAX X3 was developed to provide a number of features including high sensitivity and stability along with easy operation. Simple operation with a minimum of controls and a large display make the LORENZ DEEPMAX X3 a user friendly electronics device. It only takes a few moments to set the electronics to the prevailing ground conditions. Basalt soil and bricks present no problems. The selection of the ground filters one, two or three, in conjunction with the adjustment of the corresponding controls Ground one and Ground two, virtually cancels out unwanted signals. Even though the ground signal could be a few hundred or thousand times stronger than the signal of a small metal object, the LORENZ DEEPMAX X3 in-built technic accommodates this and only produces a signal when metal is present. This is a considerable plus over many other systems and the small reduction in sensitivity is of little practical significance. The time delay function gives additional information on the probable kind of metal located. The time delay of the eddy currents, produced in conducting metal objects, is measured and indicated with a number between zero and ninety nine. Three different ranges of metal objects can be indicated namely: small non ferrous, ferrous and large non ferrous metal objects. When an induction balanced double D coil is fitted, the LORENZ DEEPMAX X3 offers a sophisticated and refined ferrous / non- ferrous target analysis on difficult soils and the results are displayed using two different icons. Both the intensity bar graph and the audio signal increase as the search coil comes nearer to a metal object. The LORENZ DEEPMAX X3 is made for use worldwide and a wide range of accessories are available to meet customer detection needs. To suit different search and location purposes a variety of search coils can be connected to the LORENZ DEEPMAX X3. Small search coils ranging from 26 to 45cm are held by a single person with a telescopic pole. Frame coils range from 1m square to 3m square and can be made of cable coils and plastic pipes or are readily available from the manufacturer of the LORENZ DEEPMAX X3. Very simple search frames can be made of inexpensive plastic water pipes for example. The frame must be metal free and the cable coil should be mounted on the surface of the frame. The LORENZ DEEPMAX X3 has a good range of functions and can therefore be used for many search and location purposes. 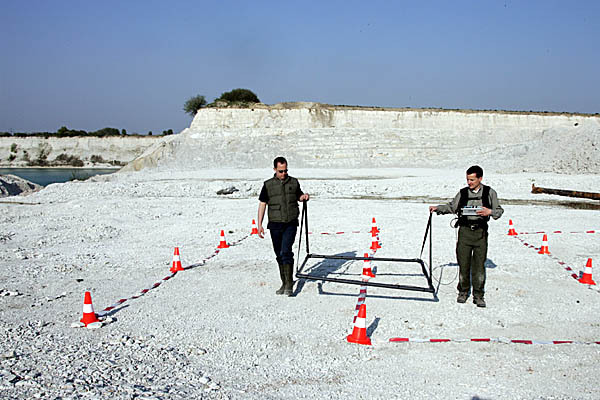 The DVD along with the booklet and the suggested practical exercises help the operator make the most of the detector in the field. Any organization that requires accurate detection and location information will benefit from the performance of the LORENZ DEEPMAX X3 when combined with optional GPS and data collection systems. Extensive multi channel data collection can be made with data collection techniques readily available from various manufacturers. Optional multi sensor detection with GPS and software is possible with several DEEPMAX X3 detectors working at the same time like a scanner. The multi sensor trigger unit makes sure that every detector and search coil works the same way with no interference generated by nearby search coils. With suitable soft- and hardware colour maps can be generated for example. Lorenz Detecting Systems provide tailor-made detection equipment and various accessories to meet customer needs e.g. detection of unexploded ordnance, meteorites, lost aircraft, underwater or underground search applications. The DEEPMAX metal detectors combine modern technological developments with a high quality product for professional metal detecting equipment. We, as a design and manufacturing company, strive to maintain the highest standards for our products and, therefore, alterations of the design, specifications as well as the availability are subject to change without notice. To generate colour, image, surface or contour maps with the Lorenz Deepmax X3, additional Hard- and Software is necessary. A very sophisticated data logger function of the Deepmax X3 metal detector together with an SD- Memory-Card 6 channel data logger will take simultaneously six channels of data when you go over the ground and stores the information into memory when this function is selected. After collecting field data the Surfer Software easily and accurately transforms the data stored on the SD-Memory card into colour, contour, surface, image or vector maps on a computer in minutes. X: Outside the range of the coil. Detection depths recorded using the medium air; DELAY1, HIGH snsitive mode. Detection depths can be greater or smaler depending on the setting GROUND 1 / 2 / 3, DELAY 2 / 3. No search coil included ! Recording field data with Lorenz DEEPMAX X3 data logger and Surfer Software. 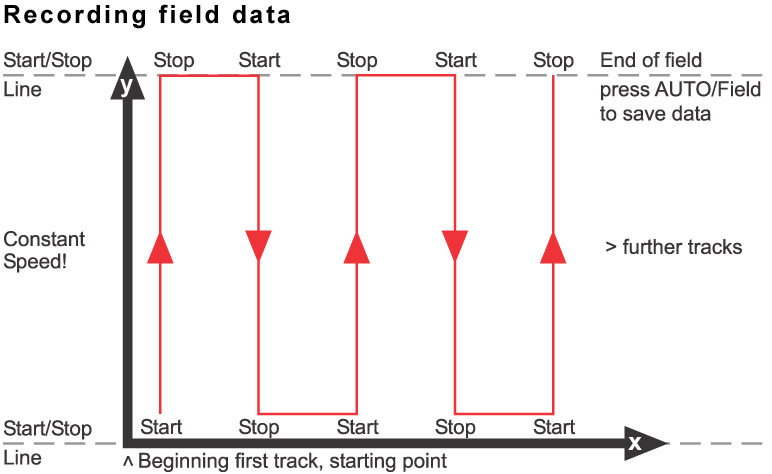 To record field data, find a starting point where X and Y lines will meet. Put a mark on the ground to find this place again. Put additional marks in the corners of a rectangle where you plan to have a field for searching. For best results cover an area of less than 20 m x 20 m. Different field sizes measuring 10 m x 20 m for example are possible as well. Try to make marks for each line that means every 1m in X direction when planning to work with a 1m frame coil. Make sure that you start in the left corner of the new field with the first track! See and compare to the pictures! Afterwards you will slowly cover the ground from the left to the right, step by step with each track you are going. To start with the data logger, connect a search coil and a battery to the Lorenz Deepmax X3 first. Then connect the data logger with the same unit, please make sure that a SD- card is inserted! To open the box press one finger on the hinge from the side and open with the other hand while pulling the flap simultaneously. Fasten the small aluminium control box to the main belt with the supplied belt. Turn on the Lorenz Deepmax X3 with the POWER button. Any false operation will immediately be indicated with a pulsed false sound. A beep alarm will also occur when no card is inserted to the SD card recording unit. Simply turn off the unit, insert a card and turn on again. Raise the coil to the air away from any metal and away from the detector itself. Press the ZERO button shortly while still holding the coil away from any metal! A short beep sound and the attention sign in the display states the beginning of a self tuning process. After 5 seconds a lower and longer beep sound and a disappearing attention sign in the screen will display that the tuning process is performed properly and that the Data logger function is ready for use. Now lower the coil to the ground. To start the first track, go to the starting point where X and Y meet. Press the same ZERO button with the arrow sign and immediately start walking in straight line along the Y axis at constant speed! Try to avoid jerky movements. Keep constant height between the coil and the ground. It is most important to keep the speed constant each track. It is possible to have a different speed but it should be kept constant in each track. A typical walking speed not exceeding 2m/second is perfect. Try to listen to the high beep sound every second when walking at constant speed. An arrow will built up in the display to show that the data is being recorded and that the operator should be in motion. When passing the end of the track press the ZERO button again. The last track will now be stored and a second, time delayed low beep tone will indicate that the data is stored properly. The delay between the high and low beep indication depends on the length of the track to be saved. Looking for additional coils or accessories? If there is any other question, do not hesitate to use our contactform. © LORENZ Detecting Systems - All rights reserved.